A parked domain is a domain that is associated with your cPanel account but doesn’t have its own content. Instead, it is pointed to your primary domain. In other words, when users will try to access your parked domain they will see the content of your main domain. To begin with, you will need to point your domain name to our hosting nameservers (for Shared Hosting plans: dns1.namecheaphosting.com and dns2.namecheaphosting.com, for Reseller Hosting plans: your private nameservers or Reseller Hosting nameservers specified in your Welcome Email). Guidelines on how to change your nameservers to Shared Hosting for domain names that are registered with Namecheap can be found here. If your domain name is registered with a third-party registrar, contact their customer support and ask to change the nameservers for your domain name to the following: dns1.namecheaphosting.com and dns2.namecheaphosting.com. 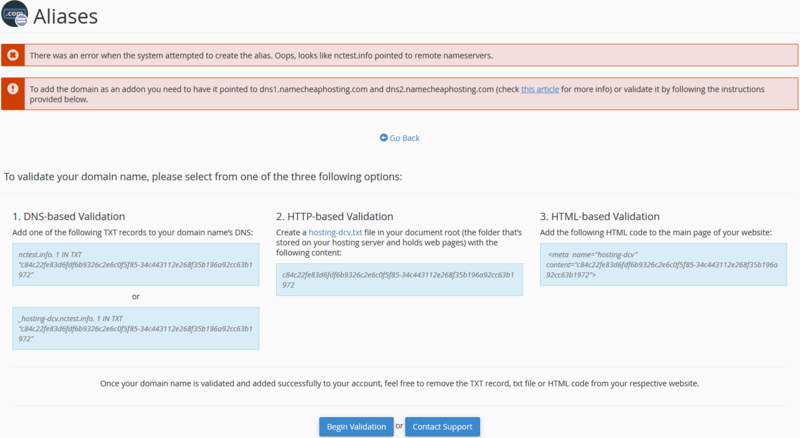 PLEASE NOTE: Parked domain names can be pointed to your main website/public_html folder only. If you want to point your domain name to a specific subfolder in your account, you need to use the Addon domains option. In such cases, proceed with the validation process described below. PLEASE NOTE: The provided validation code is only valid for 1 day. As soon as the required validation record is created, go to Begin Validation. If there are any issues with the validation, get in touch with our Hosting Support department via Live Chat or Ticket. If you wish to create an email account for your newly-added domain name, feel free to refer to this guide.